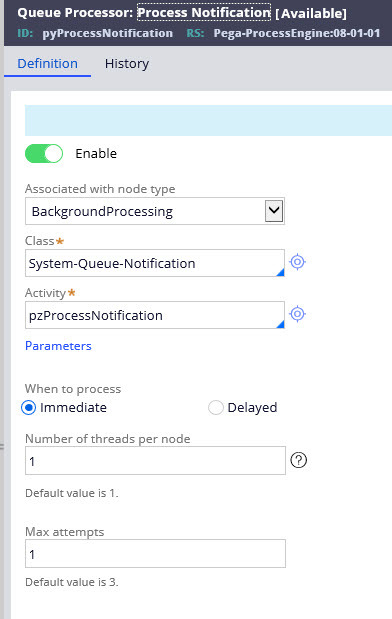 You can now create queue processors for queue management and asynchronous processing. By replacing standard agents with queue processors, you can meet highly challenging background processing requirements. You can use a standard Queue Processor rule that is shipped with Pega Platform, or you can create a dedicated Queue Processor rule for immediate or delayed processing. For higher throughput and improved scalability, queue processors support vertical and horizontal scaling, thus you can increase the number of threads in a node, or you can increase the number of nodes. You can also add a queue processor directly to your case by using the Run in Background smart shape. The following figure illustrates the Queue Processor rule form. For more information, see Queue Processor.